Fairy tales have been a part of my culture for centuries, since long before the Grimm brothers began collecting them and writing them down. They've changed -- oftentimes edited by the Grimms themselves -- and been re-told and re-imagined so many times it's difficult to keep track of them all. And yet in each one, there are images and moments that are iconic, and which always stay with us, through all the re-tellings. 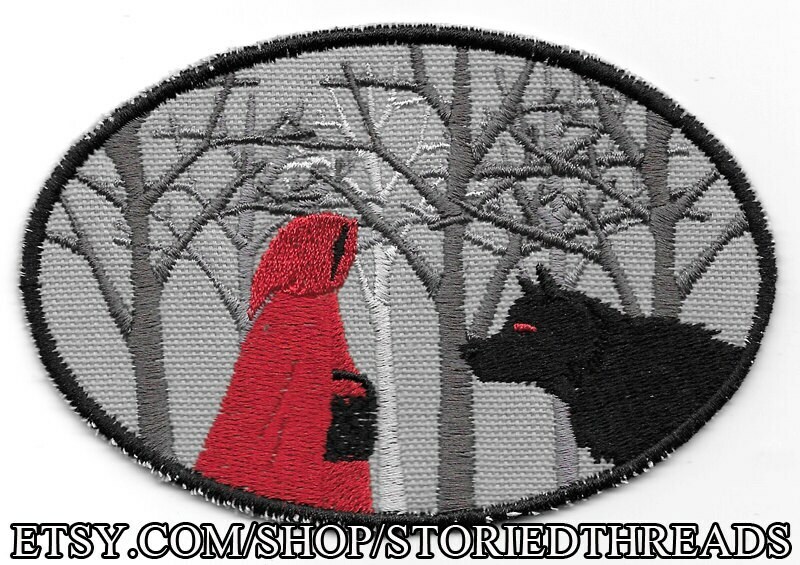 This design shows the first meeting of Little Red Riding Hood with the Wolf, shown in minimalist style against a wooded backdrop. The sew-on patch is stitched on gray cotton canvas, and measures approximately 4.7" wide by 3.2" tall. Just love this! Wonderful reference and beautiful stitch detail. Amazing quality! I absolutely love it! !